At its Double Exposure press event in New York, HTC just took the veils off the long rumored Desire Eye. Packing high-quality rear and front 13MP cameras and a bevy of photo features, the Desire Eye is HTC’s latest “premium mid-ranger,” a device that aims to blur the distinction between the mid and high-end categories. Along the Desire Eye, HTC also launched RE Camera, a “remarkable little camera” with a fresh form factor and intriguing specs. We were fortunate to get early access to the Desire Eye and RE Camera, and our hands-on impressions will be coming shortly. Meanwhile, here’s what you need to know about the new HTC Desire Eye. Camera Rear: 13MP, f/2.0, 28mm, wide angle, dual LED.nFront: 13MP, f/2.2, 22mm, wide angle, dual LED. The Desire Eye is very similar in terms of specifications and feature set with the One (M8) and its plastic variant, the One (E8). The obvious exception is in the camera department, which swaps the Ultrapixels sensor for conventional 13MP shooters on the front and rear. The quad-core Snapdragon 801 processor is still more than adequate, as are the 2GB of RAM. The Desire Eye is the only Desire device to feature an 801 SoC so far, and it’s interesting to see HTC playing with the definition of its mid-range line. The other specs are very respectable as well, including the 5.2-inch Full HD LCD, which performed excellently in our brief time with the device. The battery is slightly smaller than the M8’s at 2,400 mAh, though that enables a sleek 8.5-millimeter body and 154 grams in weight. The HTC Desire Eye is resistant to water, with an IPx7 rating (up to one meter for up to 30 minutes), a feature we’ve seen before on the Butterfly 2. Unlike Sony’s Xperia phones, there are no plastic flaps to hide the ports, which is something we appreciate. The Desire Eye is made of a smooth two-toned plastic, and, at launch, will be offered in white-red and light blue-dark blue color schemes. The feature giving the Desire Eye’s name is the front-facing camera, with its impressive 13MP sensor, dual LED flash, and wide-angle lens. Front-facing cameras have long been an afterthought for smartphone makers, but that’s changing, thanks to our insatiable appetite for selfies, as well as the OEMs’ desire to differentiate their products. 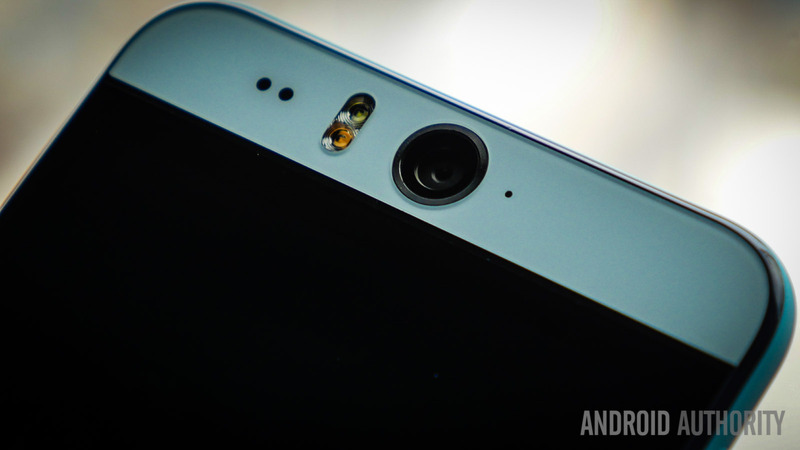 That’s why we’ve seen a steady stream of devices with 5MP or 8MP front cameras coming out over the past months, including HTC’s own Desire 820. The front and rear cameras on the Desire Eye are almost identical in specifications, though the rear shooter benefits from a slightly better f-number. The cameras seem similar to the one on the Butterfly 2, and their relatively large resolution should appeal to users who were put off by the reduced megapixel count on the M8. From our time with the Eye, as well as HTC devices with similar cameras, this should be a good all-around shooter, and the ability to take no-compromise shots with the front facing camera is special, if not completely unique. HTC packed a multitude of software features designed to take advantage of the front facing camera, as part of what the Taiwanese company calls the Eye Experience. There’s a face-tracking feature that ensures that the faces of up to four users stay in focus during video calls and conferences. Split Capture lets you combine images and video from the front and rear cameras, while Crop-Me-In lets you put yourself in scenes captured with the rear camera. To facilitate selfie taking, you can simply say “smile” or “action” to take a shot or start recording respectively. Some features launched with the Desire 820 make a return, including the self-descriptive Face Fusion and Live Makeup. Zoe, HTC’s newly re-launched video editing and sharing app, is also front and center, featuring integration with the RE Camera, allowing you to shoot, edit, and upload your videos to the cloud in record time. HTC Eye Experience won’t stay exclusive to the Desire Eye. The One (M7), One (M8), One E8, One mini, One mini 2, One max, Desire 816, Desire 820 and Butterfly 2 will get at least some of these features over the coming months. When it launches in the US this October, the HTC Desire Eye will be available exclusively at AT&T. HTC did not disclose any official info on the pricing of the phone, though from the looks of it, we expect the Eye to be priced similarly to the One (E8). The device will go on sale globally at major carriers in EMEA (Europe, Middle East, and Africa) and Asia from October. New York, 08 October 2014, – HTC, a global leader in technology innovation and design, will today herald a new era of innovation, and an exciting new direction for the business, with the introduction of a suite of breakthrough imaging products. Changing the face of mobile photography, HTC will launch RE, a remarkable little camera, the HTC Desire Eye, a brand new category-shifting phone, the HTC EYE™ Experience, enhanced imaging software, and Zoe™, a collaborative video editing community. photography innovation. Re-imagining the point-and-shoot category, RE is a small handheld camera that allows you to naturally capture and fully experience the moment, through video and photography, without anything getting in your way. With a stunning and unique cylindrical design, made to fit comfortably in your hand, RE features a built-in grip sensor that instantly activates the camera on pick up, eliminating the need for a power button. Its single shutter button allows one tap to capture photos and a longer press for video recording, so you won’t miss the moment fumbling between modes. Continuing HTC’s heritage of breakthrough smartphone innovation, today also sees the launch of the company’s new top-of-the-range HTC Desire model, the HTC Desire EYE. With one of the best front-facing cameras available on the market today, and software that puts you center frame and looking your best, the HTC Desire EYE captures life’s big and small moments in perfect clarity. Sporting market-leading 13MP front and rear cameras for detailed image quality that allows you to zoom, crop and print without compromise, the HTC Desire EYE is fully equipped for those who love to take great photos, videos and selfies. BSI sensors capture crisp photos, even in low-light conditions, and intelligent dualLED flash on both cameras provides flattering, natural tones when ambient light levels drop further. The bold, bright, dual-colour, waterproof unibody design is not only stylish but ensures that capturing your best side is as simple as possible, with a dedicated two-step camera key for focus, and capture providing comfortable, instant access to great shots, even one-handed. Featuring HTC’s new HTC EYE Experience and Zoe, with a Qualcomm® Snapdragon™ 801 processor and high-speed 4G connectivity, editing and sharing your best shots will also be smooth and effortless, wherever you are. It’s not just about the hardware though. The HTC EYE Experience takes mobile imaging software into a new league with unique features guaranteed to make you look your best. Taking video chat and conference calls to a new level of quality and performance, the HTC EYE Experience’s face tracking keeps you perfectly framed at all times. And because staying in touch means more than just talking to a single person, up to four people in the same room can also be tracked comfortably, with each face cropped and positioned on the screen for maximum clarity. So enjoy the freedom and flexibility of services like Skype without worrying about exactly where you or your friends are standing, as the camera will follow everyone. Want to share even more on the move? The option of screen sharing brings desktop functionality to smartphone-based video chat for the first time. The HTC EYE Experience opens up a new world of creative opportunity, thanks to the new Split Capture function. Combining simultaneous photos and videos taken on the front and back cameras into one split-screen image or video, this creates a new selfie experience, allowing you document your journey and your reaction without relying on thumbnail views. Crop-Me-In places you at the heart of the action by cropping you from the image or video taken with the front-facing camera and positioning it within the scene captured by the main camera, opening the door to more extreme, exciting selfies and videos. Voice Selfie removes the need for awkward hand contortions by enabling you to trigger the shutter release with a simple command. Simply “say cheese” or “smile” as soon as you’ve struck the perfect pose or trigger the video recording with “action” or “rolling” commands. Allowing friends to remix their content with yours, Zoe creates the ultimate highlight video for all to enjoy and share through their favorite social networks. Zoe 1.0 brings flexibility to the community, enabling short, medium and long Zoes that can be made up of just a couple of still images, or an entire series of video clips, with its new content engine making it easy to present small numbers of clips or even individual images in an interesting, visually stunning way.